Leaders should not disrespect their constituency. But the search for Baltimore’s next police commissioner has been a long and sorry saga of one disrespect after another. I think about the people I sat with in City Hall on a Saturday many news cycles ago, all of them there to offer their thoughts on policing in Baltimore, and specifically the proposed hiring of Fort Worth Police Chief Joel Fitzgerald. There are a hundred things that adults would like to do on a Saturday morning. None of them, I’m sure, involves getting out into a cold grey morning, lining up to be patted down by City Hall security, then sitting for hours on uncomfortable chairs in the Council chambers. But people did it. They came for the January 5 public hearing by bus and by car. They did their research. They were prepared with facts. One man handed me his statement, written out, multi-paged and carefully sourced. Two young men came late in the day, looking as though they’d just gotten off work. Others spoke about being city residents for 30, 40, 50 years – and never giving up on the place. Little did they know that Fitzgerald, the mayoral-anointed candidate they were giving feedback on, was pulling out and being replaced with another candidate. City Solicitor Andre Davis, who attended the hearing, made the phone call that very same day to offer the job to New Orleans Police Chief Michael Harrison – something that wasn’t made public until two days later. How likely was it that anything anyone said in that hearing room across six hours was going to divert City Hall from giving the job to Fitzgerald or, once Fitzgerald pulled out, citing his son’s medical problems, to Harrison? It all looked to me, as a reporter who has written about the city’s myriad policing issues, like deep disrespect. But I wanted to push beyond myself, so I called up Greta Willis, one of the 51 people who testified that Saturday. Another Rabbit out of the Hat? Willis has been campaigning on behalf of Baltimore mothers since 2006, when her 14-year-old son, Kevin Cooper, was gunned down by the police. She says that her son was holding a plastic dustpan. Officers alleged that he was holding a stick, which he had used to hit them. Going into the hearing, Willis knew what had happened the previous day. Two newspapers had published stories questioning Fitzgerald’s resume. Baltimore officials quickly announced that Fitzgerald’s son was going into surgery and he was canceling his planned meetings in Baltimore. Willis, like many others that day, was leery of Fitzgerald. 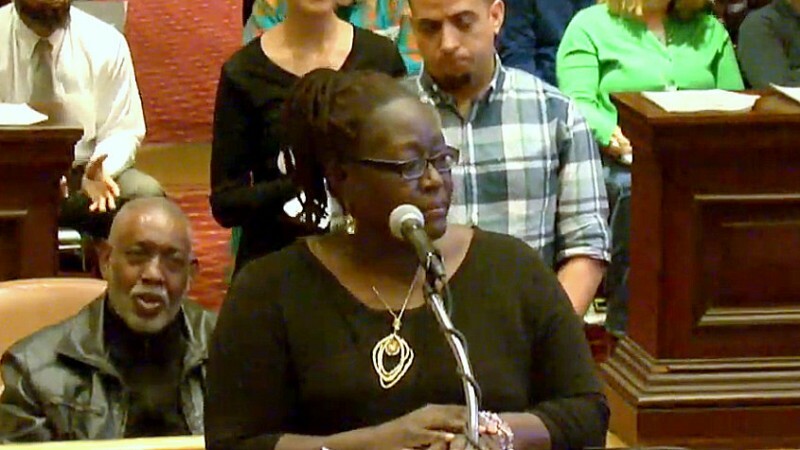 “We don’t need another person to come into our city with corruption already following them,” she testified. Now comes Harrison as Mayor Catherine Pugh’s latest selection. Willis doesn’t feel good about how the mayor thrust both names forward, never presenting multiple choices before citizens as many jurisdictions nowadays do. “I feel let down right now,” Willis said. Willis told me she travels around the country talking about policing with mothers. She would like to talk about reforms going on in Baltimore, but can’t just yet. “I want to be able to say that Baltimore is changing, Baltimore has something great to look forward to,” she said. “But at this time, I’m not able to speak like that with an honest voice regarding our department. She doesn’t think they are, which is another form of disrespect. The mayor and the Council seem anxious to put the Fitzgerald episode behind them and start fresh with Harrison, who is, by many accounts, a more palatable pick. “I applaud Mayor Pugh for putting forward an individual who is both clearly qualified and wants to be the next Baltimore Police Commissioner,” Councilman Eric Costello tweeted the morning of the Harrison announcement. “It is imperative that we move forward with an extreme sense of urgency,” he wrote. I asked Costello later if that was what his constituents wanted. After all, so many speakers at the Fitzgerald hearing warned against bringing in someone from outside the city. He said that only one of his constituents was at the hearing, but that he’d received emailed communications from others saying they were ready to move on in the search process. I asked how many reached out to him and what they said. I never got an answer. It is critical for our leaders to demonstrate that they are actively listening to those they represent and acting on their behalf. If they can’t, please give us a clear reason why not. With recent events making painfully clear that trust between Baltimore’s police and its citizens is sorely lacking, how can City Hall fail to take such a simple step to begin to build that trust? No strategy for “fixing” law enforcement in Baltimore can succeed without that foundation of mutual respect. So now there will be meet-and-greets and more hearings about candidate Harrison. After watching the last go-round, it’s clear that city leaders need to do a better job. At the last hearing, a man from the immigrant group CASA gave his testimony in Spanish, which no one could understand until someone, also from his group, stood up to translate. How can we make this process accessible for non-English speakers? There should be transportation available for people who have none. The administration should make sure that people in every part of the city get a chance to speak to Harrison and have their say. Look at other U.S. cities and develop ways to increase transparency and inclusion. Last week, the City Council called on the Maryland General Assembly to allow the formation of a Baltimore police commissioner search committee. It was adopted by a unanimous vote. That’s a good start. If such a committee is formed, it should look at other states and cities and develop ways to increase transparency and inclusion. Citizen engagement to interview and vet commissioner candidates – the kind of engagement that Mayor Pugh had promised Baltimore but never delivered – is essential. With our city mired in rampant street crime, near daily murders and constant police department scandals, it might seem as if we don’t have the time for that approach. But the mayor’s behind-closed-doors approach has scarcely been speedy. It has been eight months since the resignation of our last commissioner, Darryl De Sousa. And he had only been on the job for three months. That translates into a leadership vacuum that Baltimore can ill-afford without lasting and perhaps permanent damage.